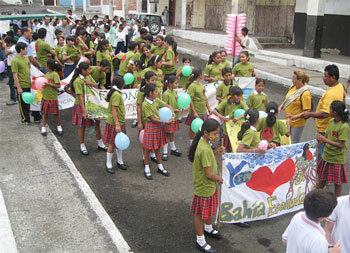 June started off with a parade to celebrate international day of the environment. 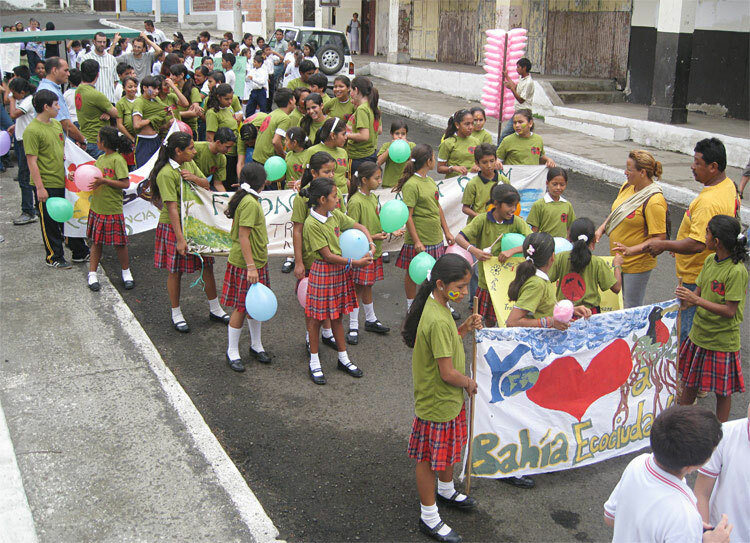 Bahians love to celebrate days dedicated to causes, and they love to parade. It happened to be a great opportunity for the Bioregionalistas to show off their brand new Planet Drum tee-shirts, so we decided to join the festivities. The parade went well, and afterwards, different people had a chance to speak to the group about environmental themes. Some of the Bioregional Education students took the opportunity to share Planet Drum’s message. Bioregionalismo students get ready for the international day of the environment parade. At the municipal building, Nicole shares a few words about Bioregionalismo with the other participants. 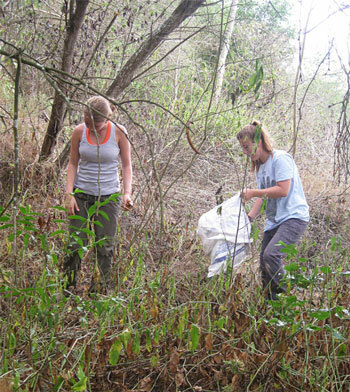 Due to a lack of rain probably related to the on set of the dry season, we’ve been watering revegetation sites as necessary. 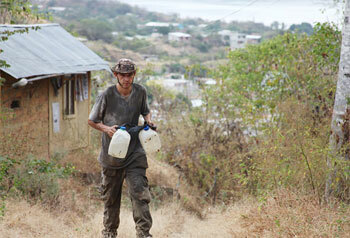 There are three sites this year that need regular watering: Universidad, Dr. Parra, and Jorge Lomas – Don Carlos. Chris carrying water jugs at the Don Carlos revegetation site. After a week of hard work in the field and at the greenhouse, we took a Friday to visit the Rio Muchacho farm and have a tour of their organic/permaculture activities. 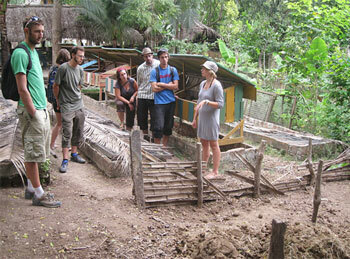 Planet Drum volunteers receive a tour of the Rio Muchacho farm. Here we’re learning about their different composting methods. 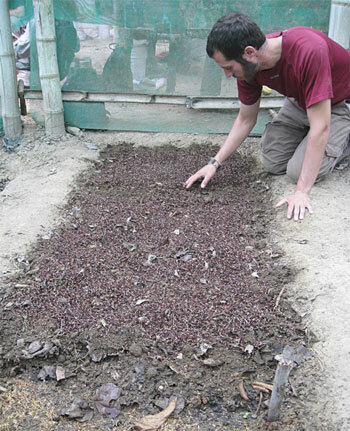 At the greenhouse, two seedbeds exploded with seedlings, one of Chirimoya and the other with Pechiche. These are the two native fruit trees we have had the most success with (in terms of revegetating and donating to communities). They are relatively hardy species as far as fruit trees go and the fruits are quite sought after. It is possible that there are upwards of 800 trees in each of the seedbeds. Needless to say, an abundance of work has sprouted at the greenhouse. 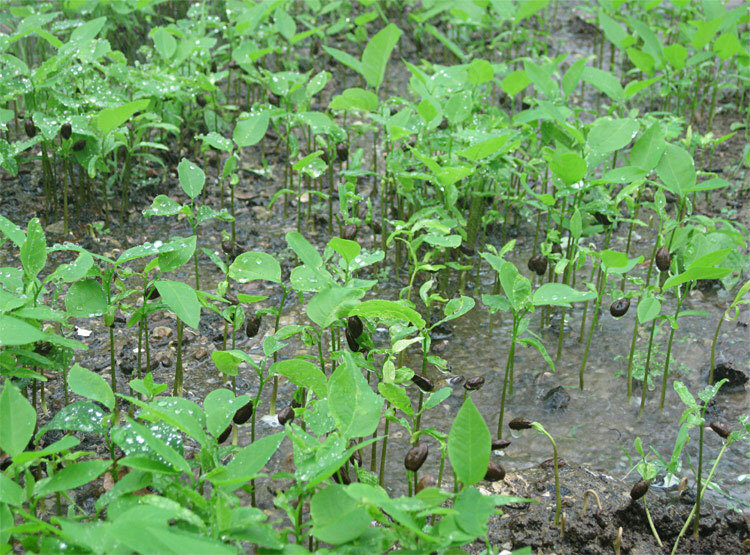 A seedbed with Chirimoya seedlings quite literally explodes. In addition to these two beds, beds of Algarrobo, Jaboncillo, Guachepeli and Seca are also germinating, although a bit more sporadically. The result of all these trees coming up is that we need to transplant them, which is an involved process. Allow me elaborate. First we collect bottles around town. 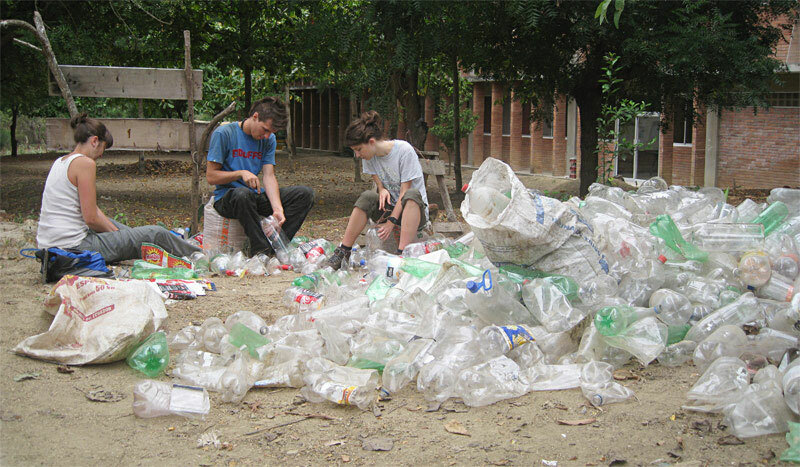 Many local citizens have gotten used to seeing us wandering around picking up bottles and have decided to help us by separating out their empty bottles from their trash so that we can get a bunch at once, without having to pick through garbage. After talking to them about the work we do, the end result has often been that we offer to give them trees in December in exchange for bottles now. Now every time we go to collect bottles more and more people are waiting to give us bottles. And more and more will be expecting trees – fortunately those seed beds are looking so good. 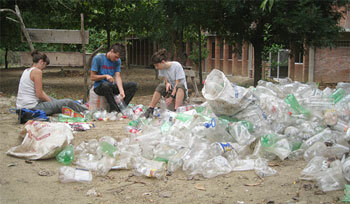 Kendall, Guillaume, and Anneliese tackling a pile of bottles. 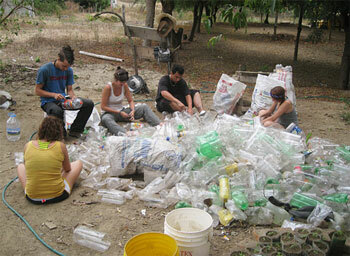 On another occasion, volunteers working on yet another pile of bottles. Bottles are then transported to the greenhouse, either via truck if there are more than 10 sacks worth (each sack holds about 20), or just on the bus. Once at the greenhouse we cut the tops off the bottles and make holes in the bottom. This can be a daunting task if the pile of bottles resembles a mountain of plastic containers. Heidi, Zach, William and Jonah prepare a triple batch of soil. 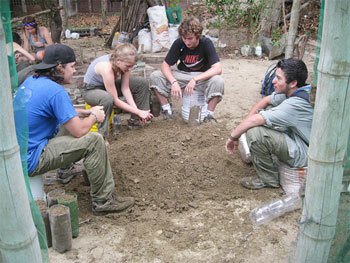 While bottles are being cut, other volunteers begin to mix up a pile of soil. Our latest mix of soil contains: 1 bucket of rice shells (hulls), 1 bucket of river sand, 1 bucket of compost (made from our kitchen scraps and saw dust), and 2 buckets of regular dirt (nutrient poor and very high in clay content). William, Heidi, Zach and Jonah filling up bottles. Keeping the proper ratio, this recipe can be scaled up as needed; large batches will call for triple everything. This is kind of like putting together ingredients for a large salad or cake, which would feed a small army. Once the soil is sufficiently mixed and moistened, the bottles are filled. A properly filled bottle should be tamped down so that the soil is compact and approximately one inch (2.5 cm) below the top of the bottle. Volunteers and bottles with trees packed in tight at the greenhouse. As bottle fillers complete the bottles they must be transported to a shady area where they won’t fall over. Shade is needed because direct sunlight will make the transplanting process that much more difficult for the baby trees. Since we’ve been transplanting more trees than ever before, we’ve had to get increasingly creative in making spaces to put the bottles. Pieces of wood make good barriers so that the bottles don’t fall over, and they are secured into the ground with Moyuyo stakes. Once in a suitable place in the shade, a hole is pushed into the soil with a stick. The depth depends on the tree that we are transplanting, but is usually about 4-6 inches (10-15 cm) deep. Now the bottle is ready for the tree to be planted. 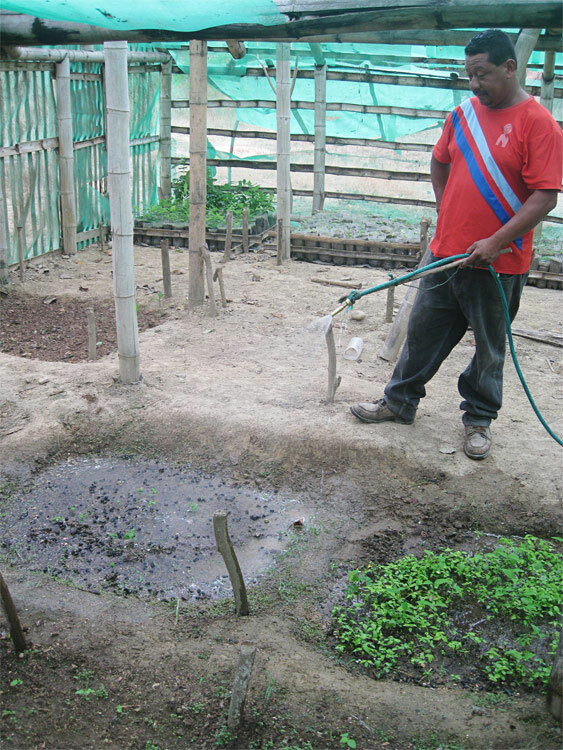 Orlando drenches a seedbed for transplanting. 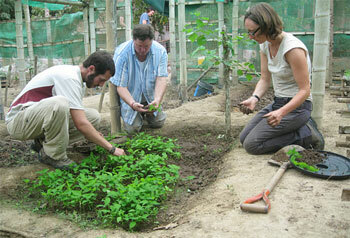 Tom, Stephen, and Anja dig up Chirimoya seedlings for transplanting. Although it might not look like it, there are easily another 400 seedlings in the seedbed waiting to be transplanted. A seedbed that has seedlings ready for transplanting is doused with water so that the soil is soft. The trees are then dug up in batches and moved out to where the bottles are waiting. The roots are kept in moist soil throughout the process. After planting them in bottles and pushing in the soil around the root, water is dripped into the bottle. Occasionally the tree will need some additional soil sprinkled in the bottle to help it stand up straight. Anneliese and Ricky planting Chirimoyas in bottles. 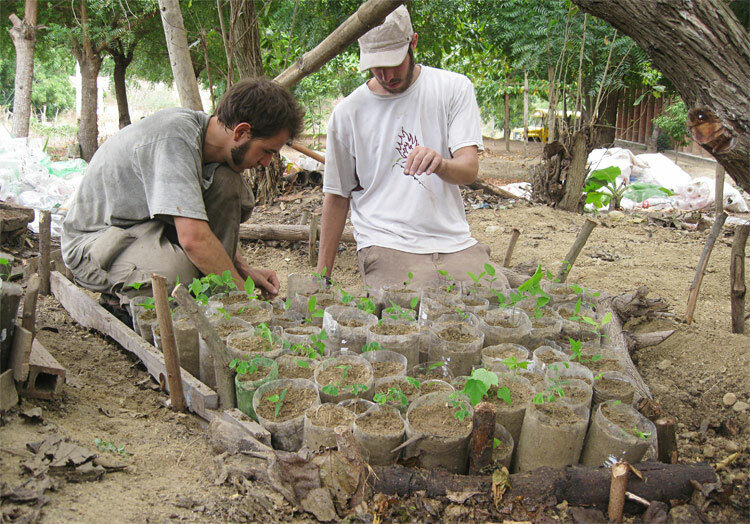 Chris and Tom transplanting Chirimoyas. Each transplanted tree requires this entire process to be carefully carried out; otherwise it may suffer and or die. There are currently well over 2,000 transplanted trees in the greenhouse. These trees will grow and be cared for until the upcoming rainy season, when they will hopefully be about 3.3 feet (one meter) tall. Hundreds of baby trees waiting in shade for two weeks after being transplanted. In the background volunteers work on filling bottles at three different stations simultaneously. How have we managed to obtain so many transplanted trees in such a small amount of time? With lots and lots of help. 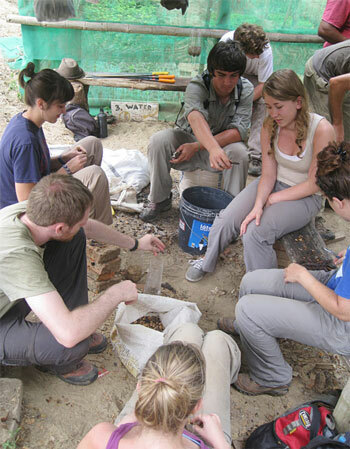 In June there have been between five and seven volunteers at any given time. For the last two weeks, a group of ten people from Sage educators in northern California has been volunteering as well. 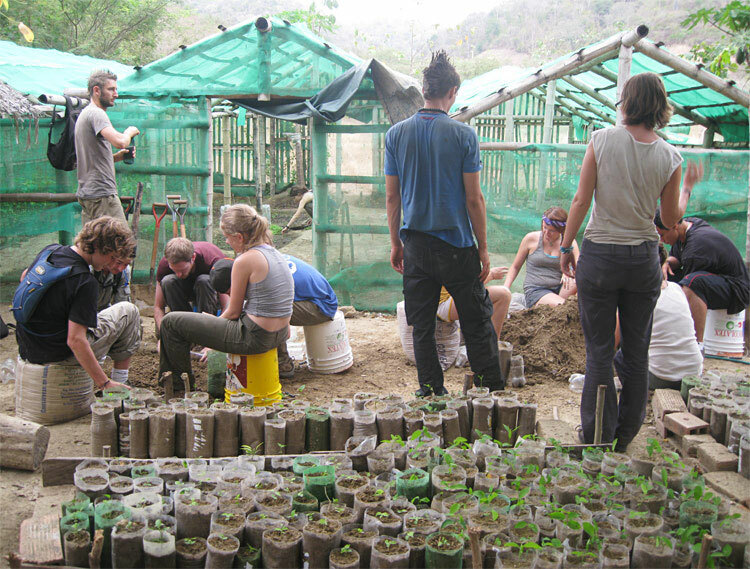 And for the past three weeks, a group of twenty plus Bioregionalismo students have visited the greenhouse to help transplant. Tom plants a seed bed with Laurel seeds. 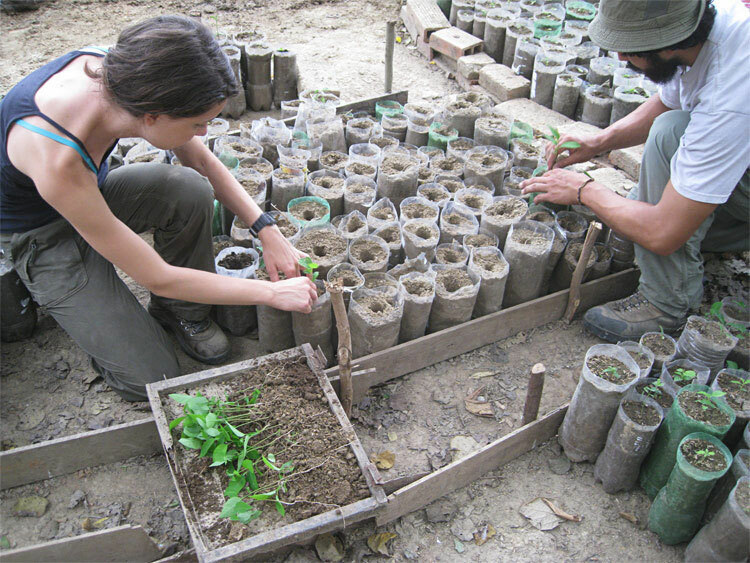 Recently new beds of Algarrobo, Jaboncillo, Laurel and Guayaba have been planted, all of which are showing signs of growing many more trees, which ensures keeping us busy for the coming months. 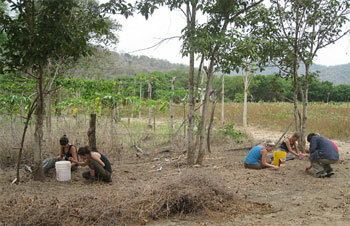 With help from so many people we also prepared more batches of Cascol and Guachepeli seeds to be planted. Anja, Chris, and Celine, break open Guasmo seeds for planting in the beds. 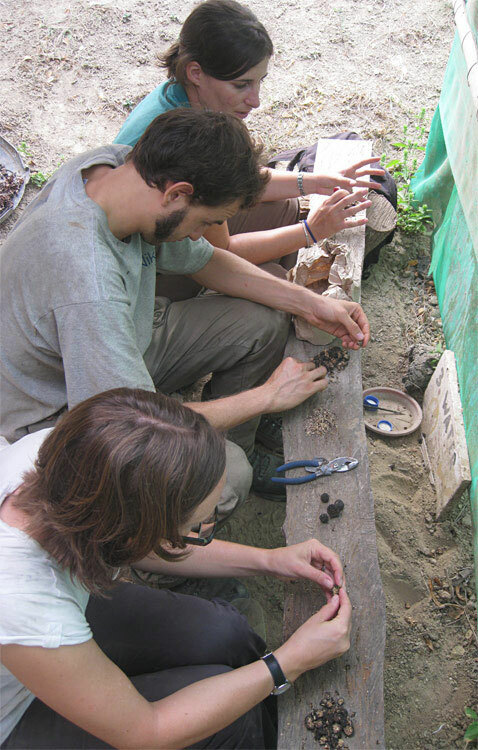 Ben, Kendall, Jay, Heidi, Maggie, and Jaime prepare Cascol seeds. 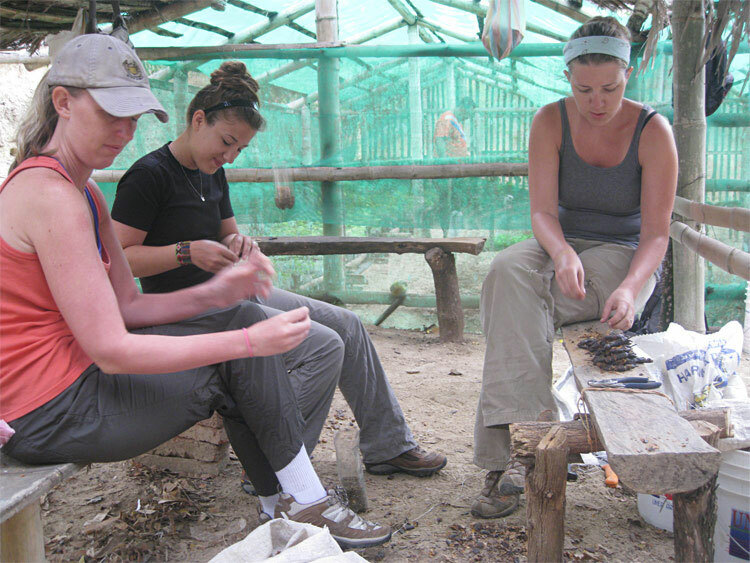 Linsey, Maggie, and Jaime working more on Cascol seeds. Heidi and Maggie hunting for Algarrobo seeds in Bosque en medio de las Ruinas. Some minor additions have been made on the greenhouse, including a new bench and a backpack rack. A major overhaul of the break area and the entire greenhouse will need to be made in the not too distance future (at least before the next rainy season). 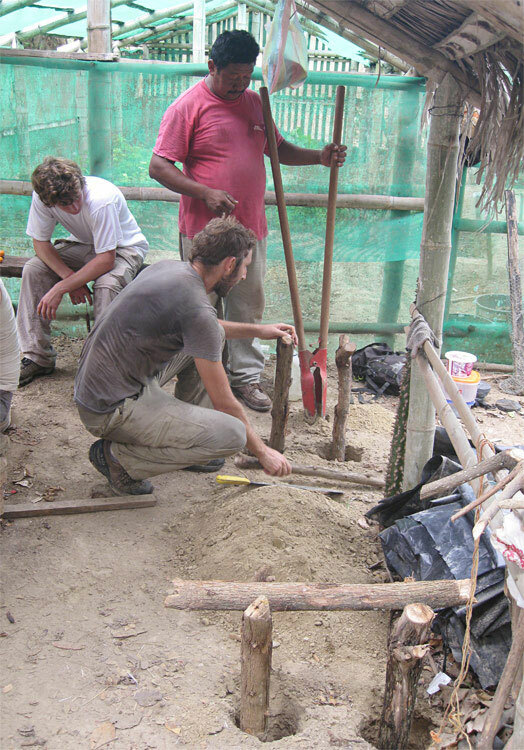 Jack and Orlando construct a new bench at the greenhouse. 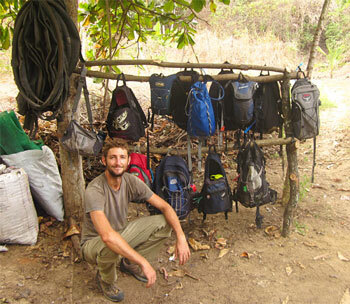 Jack with his back pack rack. A day was spent out at our Bioregional Sustainability Institute land, where we worked on opening up a road that will provide access directly to the Planet Drum land from the road. In the near future we hope to have some heavy machinery open up the access road on a steep, partially eroded hill and then we will need to pass a stretch that has been overgrown with shrubs. 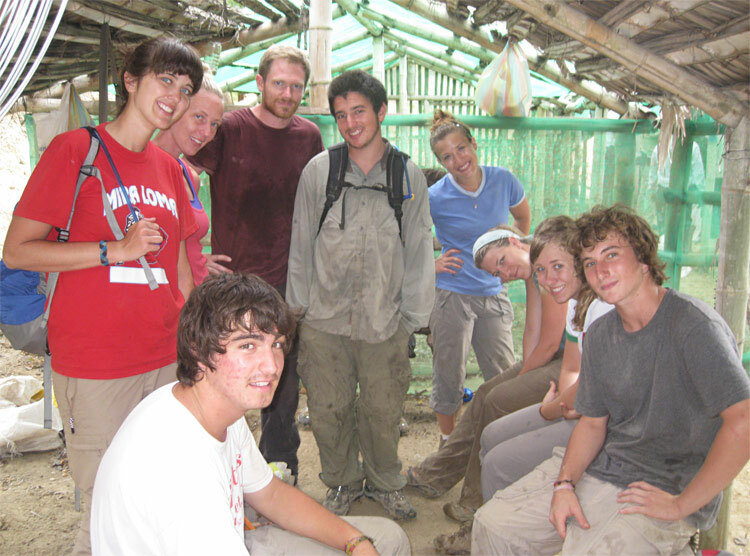 So between all of us we made a dent in the machete work. Liberto, Chris and Jay machete clear the overgrown road. Chris works without pants since they were needed to fashion a stretcher. That’s teamwork! 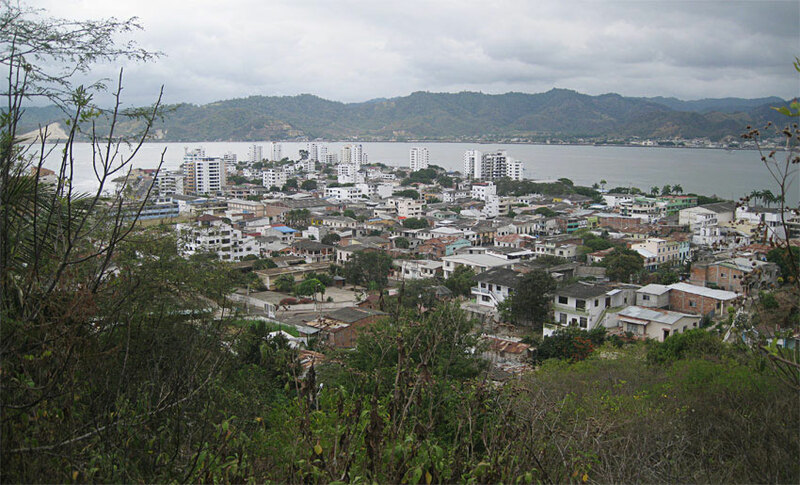 One girl had a minor machete accident, when her machete slipped from her hand and hit her ankle, cutting her. We quickly bandaged the wound and elevated her ankle, which stopped the bleeding. But the wound prevented her from being able to walk, so we also had to fashion a stretcher out of two pieces of Moyuyo branches stuck through two pairs of pants (mine and Chris’s). Taking turns, four people at a time, we carried her for a half an hour and up a small mountain to where our ride picked us up. We drove her directly to the hospital where they attended to her almost immediately. A few stitches later and she was ready to go home. They didn’t ask for any ID or even charge us anything. A potentially ugly situation was handled without much hassle. 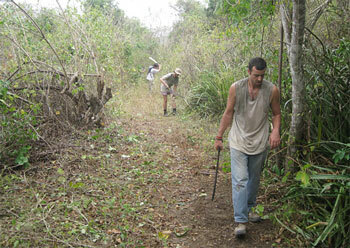 Jack clears a trail through grasses in Ruinas. I decided to take advantage of all of the help that we’ve had recently to make a new revegetation site for the 2012 planting season. 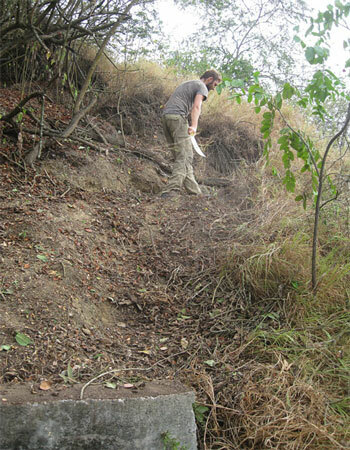 Revegetation sites require trails to be macheted clear and holes to be dug so that trees can be planted. 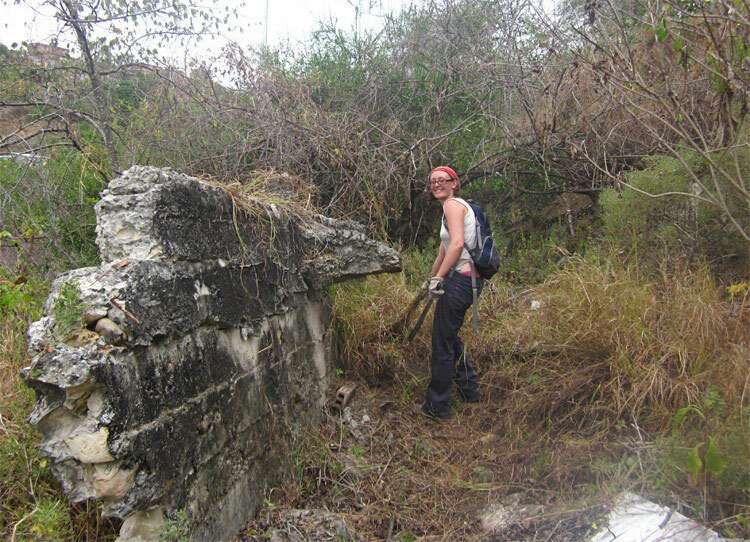 In May we fixed up the trails in ‘El Bosque en Medio de las Ruinas’ and I noticed that there are a few areas that could really use some more vegetation, particularly in the bottom third of the park. Previously I was under the impression that there wasn’t space there for more trees. 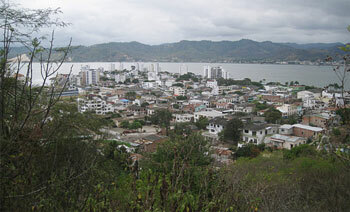 The view from the hillside in Ruinas. Anja clears a trail alongside cement ruins. So we began macheting new trails. In two days we opened up enough trails to plant what will hopefully be at least 400 trees (at one tree every 3-4 meters, that’s 1200-1600 meters of trails). It was quite impressive to see 15 people macheting in different directions. And trails were made on an entire hillside in just one day. 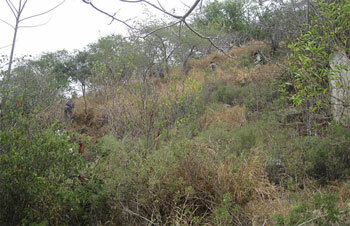 Volunteers attack an entire hillside, clearing trails there in just one day. As a personal project, Guillaum is working on a book of information about 14 of the native Dry Tropical tree species with which we work. So far we’ve learned that an Algarrobo tap root can reach up to 50 meters in length in order to find water, and their lateral roots can trail up to 60 meters in search of nutrients. 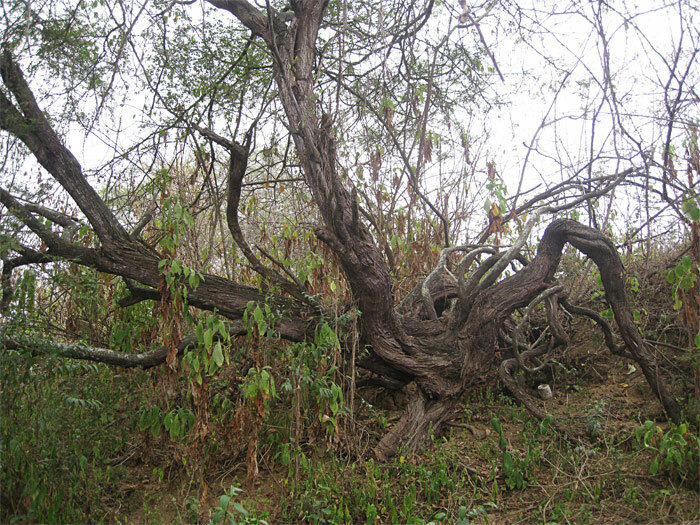 Here’s one from El Bosque en medio de las Ruinas that has survived mudslides and soil disruption and continues to grow without any problem. 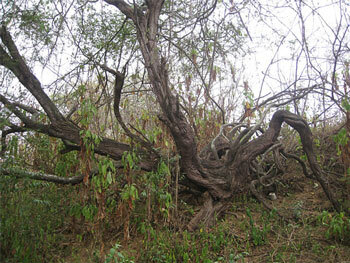 An Algarrobo tree that has been tilted due to disturbed land continues to grow at a new angle. The final piece of news is that we received a visit from staff members of the Cerro Blanco reserve (near Guayaquil). 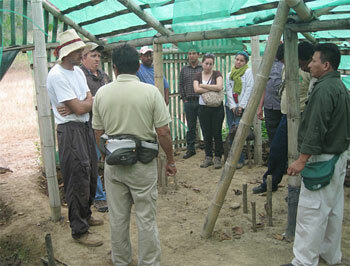 They have a much larger greenhouse operation there and were visiting projects in the Manabi province. They were impressed by the work we do, even though if it’s on a smaller scale, and they liked our reutilization of plastic soda bottles. We discussed tree planting techniques and different tree species. 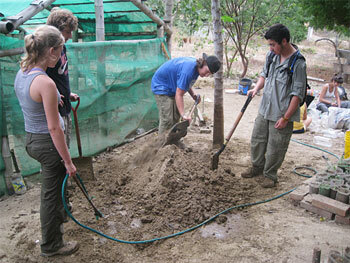 They even pitched in with some of the work, helping to mix soil and transplant trees. I talk about Planet Drum and its projects to a group of visitors from Cerro Blanco. The group of volunteers from Sage Educators. Thanks for two weeks of hard work and good times! 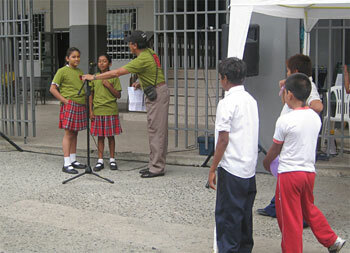 In the near future we will have visits from the Children of Ecuador organization and the Amazon Mycorenewal Project. It’s been great to have so many people helping out with the projects, especially since we have so much work to do. 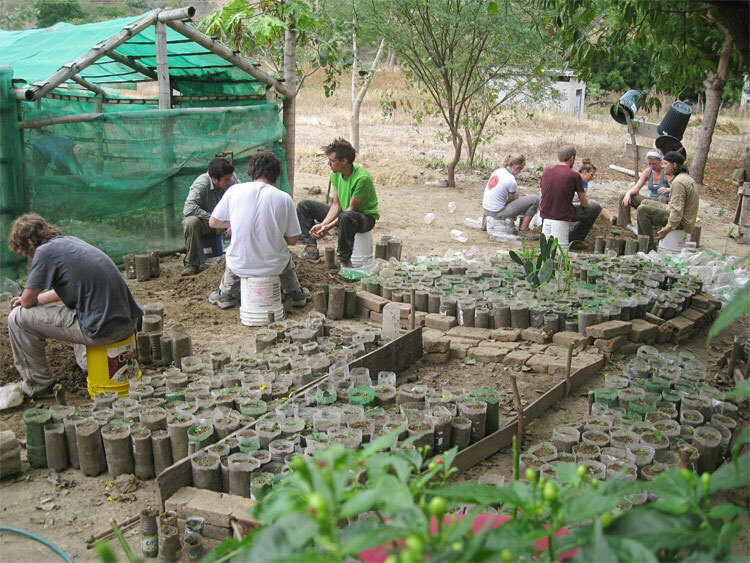 If we keep going anywhere close to this pace, we should easily surpass 5,000 trees at the greenhouse for planting in 2012.